It's been awhile since we had one of these things! 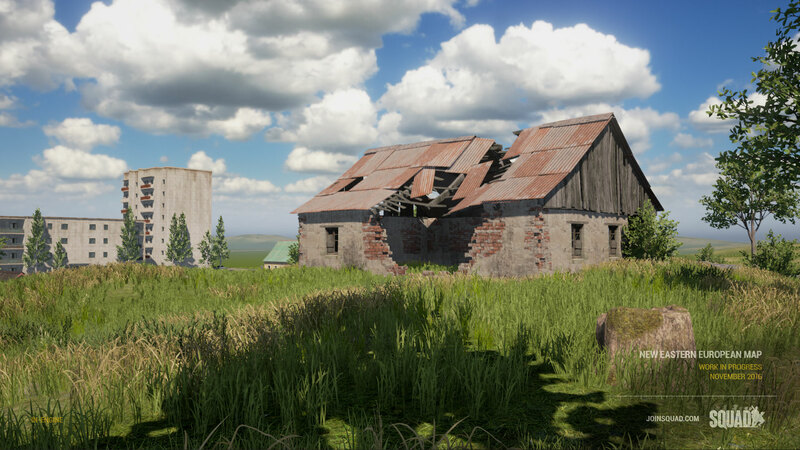 For those new Squaddies that are not aware, every month we put out a Recap on whats been happening behind the scenes in Squad development, and is a great way for us to tell YOU what we've been working on. This year we really wanted to do something special for Veterans Day, so we went all out with a huge 50% off sale, Squads very first free weekend, and the Call to Arms campaign to raise $20,000 for Stack-Up, a charity that supports veterans with video games. On November 11th, Squad Up 4 Stack-Up raised over $19,000 to support US, NATO, and ANZAC veterans through deployments to combat zones and anything the world throws at them once they get home. Big thanks to everybody who watched, streamed, played, and contributed during the event - your support is what made the campaign a success. Our goal was to raise $20,000 by December 31st& That goal was met and surpassed a full month and a half before our deadline. We had not one, but TWO Steam sales this month! Hopefully you got in on the action, especially over the free weekend. There was some concern that the weekend would be absolute chaos, and it was - in the very best way. The community was overwhelmingly positive in welcoming the influx of brand new players, helping them understand the game, and guiding them through their first traumatic experiences. All that fresh blood gave the game a new vitality, and were happy to welcome all the new players who stuck around from the free weekend and both Steam sales. We also went a little wild and did Cyber Monday for the Squad Merchandise Store. With all those sales, you should be all set for a holiday season filled with Squad! Last year Squad was the runner-up in IndieDBs Indie of the Year award, and after a full year of major updates and improvements were asking for your vote again. Only 9 days are left to vote Squad into the top 100 round - if its your favorite indie game, make sure you get in there! 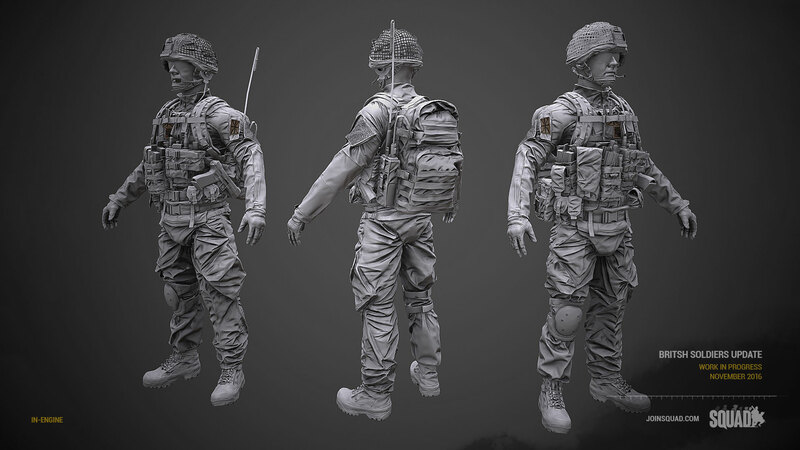 Over the past year we've been hard at work in the background trying to get together the talent and the pieces behind the new animation system for Squad. 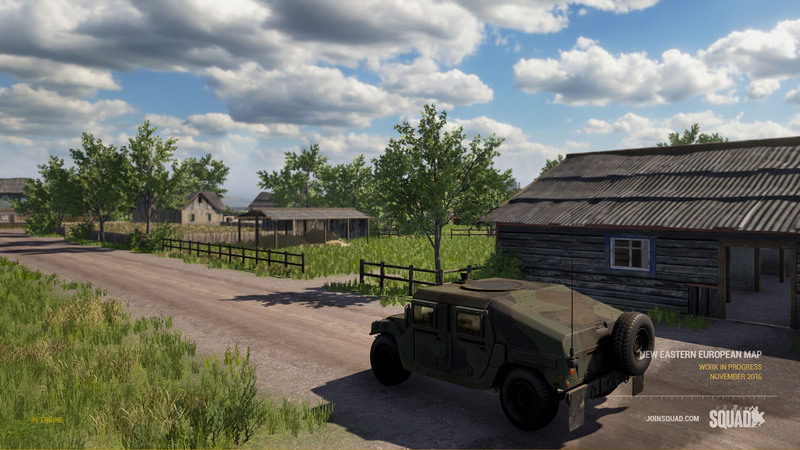 Since going into Pre-Alpha, Squad has utilised virtually the same Animation System to drive its character movement and weapons handling, and it is definitely showing its age. The Weapon and Inventory system is the single oldest system in our code base, created back in 2014 for the original Squad prototype. Since then, we've tacked on more and more requirements to the system and hacked together a number of little features, such as shovels, medical kits, and bandages. As we progress further, we've started to hit the extent of what is possible with the current system, and we've found ourselves a great need to re-engineer the weapon system to better support the wide variety of new weapon types we want to add. Since the release of Alpha 8, we have started building a robust and extensible equippable system we are calling CoreInventory (although that name may change). We are basically re-architecting the old system onto a far more robust and mod-able platform, as well as prepping it for use in future games we create. 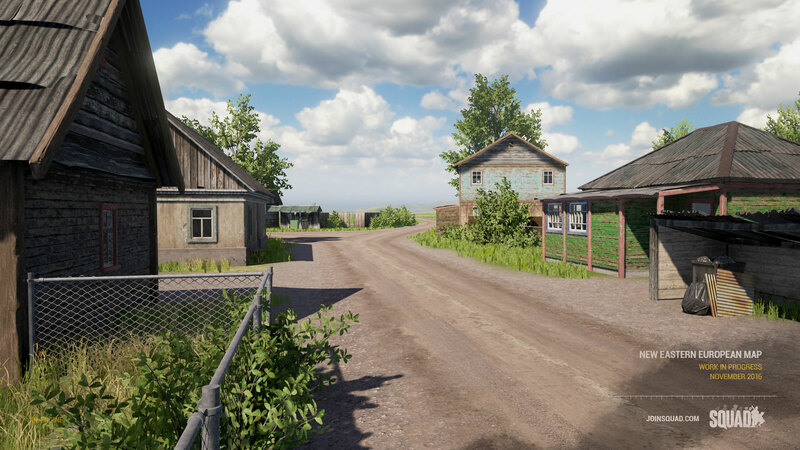 We are also laying the groundwork for a much more robust medical system, as well as the groundwork for kit customization system with attachments, fixing a few pesky bugs, as well as allowing equipment animations to cancel when switching weapons. 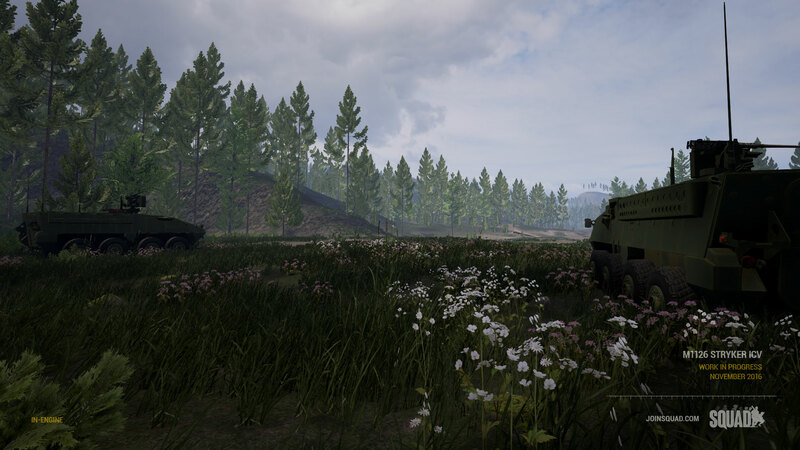 Finally, we are implementing a system that allows us to place stat-changing Effects on players, vehicles, and potentially deployables, that allow us to expand on the effects of being injured, suppressed, revived, or any number of events that happen in our game. We are just in the early days of building it, so expect to see more about CoreInventory in future recaps. Revealed in an earlier monthly recap, the SPG9 is almost ready for action! Emplaced or mounted to a technical, it is capable of firing High Explosive Anti-Tank (HEAT) rounds at velocities faster and ranges further than the RPG-7. However the gunner and weapon are extremely exposed when engaging the enemy, so this should be the equivalent of a glass cannon for the Insurgent and Militia factions. 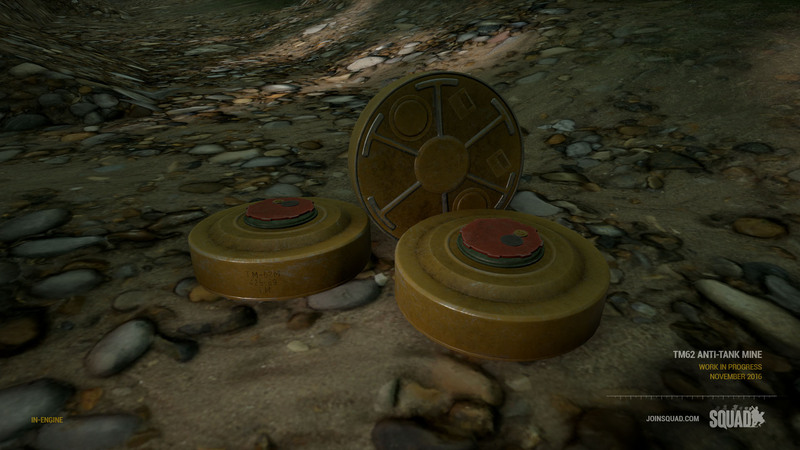 To go along with the Improvised Explosive Devices we have already shown off in a previous recap, unconventional forces will also get access to victim operated anti-tank mines such as this soviet era TM-62 mine. Capable of ruining the day of all but the most mine-resistant vehicles. 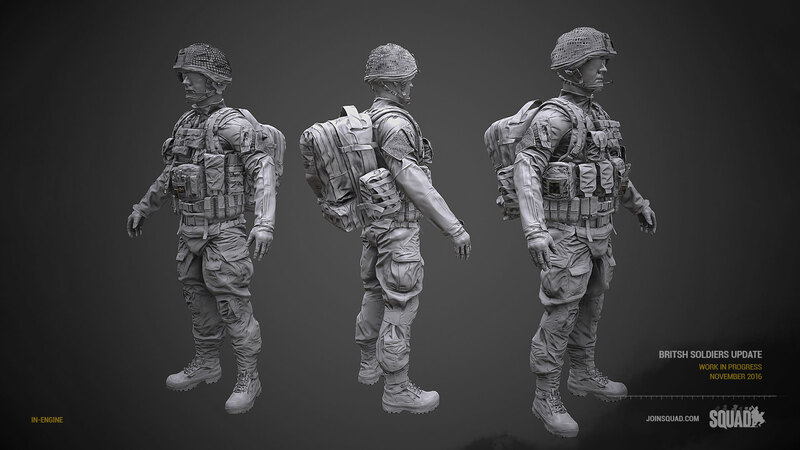 As announced in an earlier Monthly Recap, the Brits are coming to Squad! 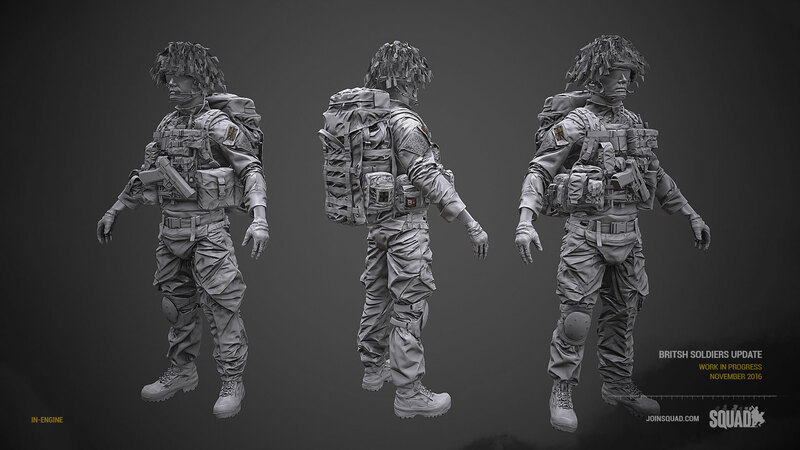 Over the past few months more solid progress has been made with the artwork for its characters and weapon systems. 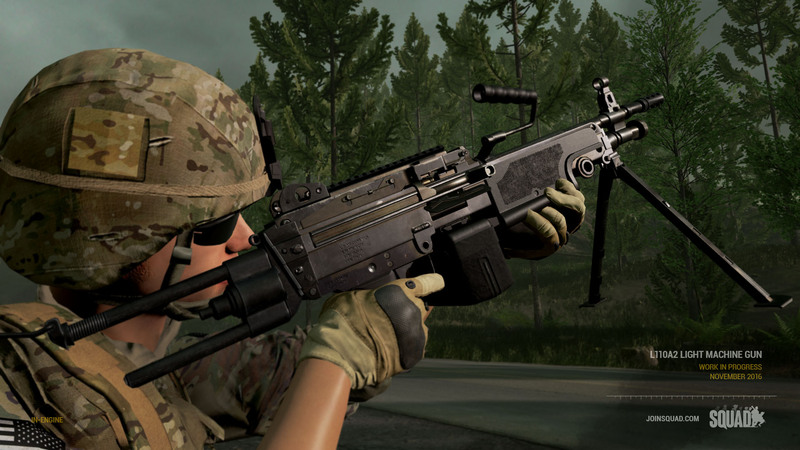 Based on the same platform as the US Army's M249 SAW, the L110A2 LMG as used by the British forces has been completed. The L110A2 will be available with iron sights as well as a SUSAT sight. 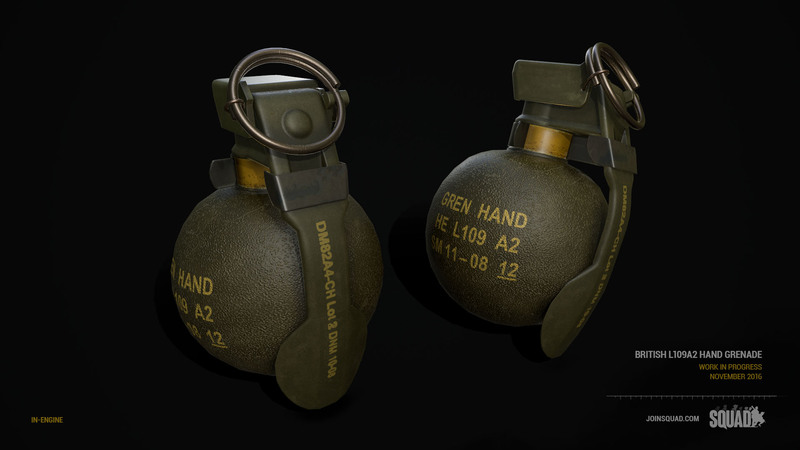 Standard British fragmentation grenade has been completed. The main armament used by the British ground forces are the SA80 series of rifles. Seen here is the main service rifle, the L85A2 with a rail hand guard, and shown with iron sights. The L85 has been seen in many different configurations in recent years, such as with the SUSAT sight, an ACOG and a back up reflex sight and most recently being fielded with an Elcan sight. Expect to see most of the above options available in time. 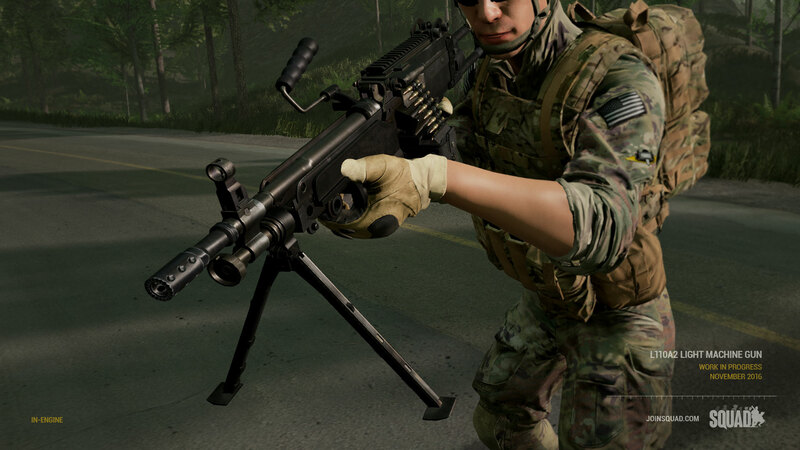 Your first experience with the L85 in Squad will be with a set of iron sights or an ACOG without the back up sight. 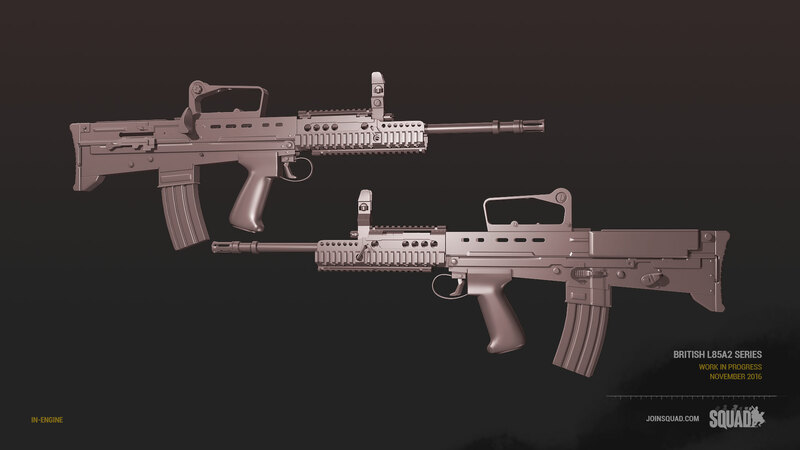 There will be other additions to the family of SA80 rifles, such as the short L22 carbine used by vehicle crews, or the mostly outphased L86 Light Support Weapon that will be temporarily filling a DMR style role for the first few patches with the British faction until a proper DMR has been finalized. 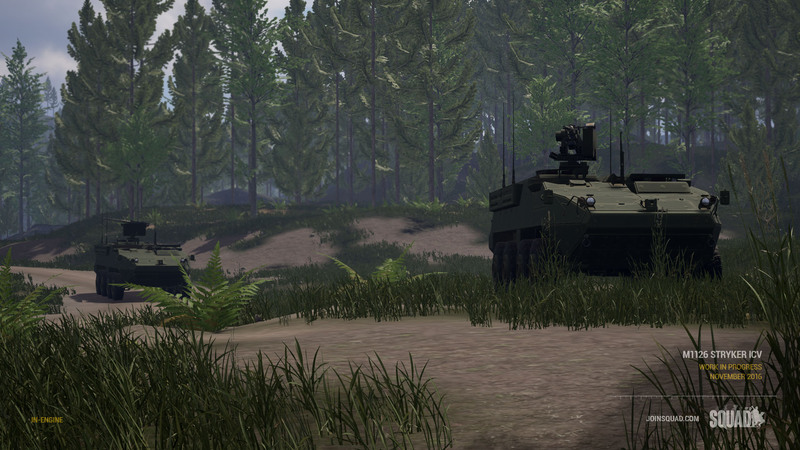 Shown off a while ago, the Stryker is just about ready to hit the battlefields of Squad! 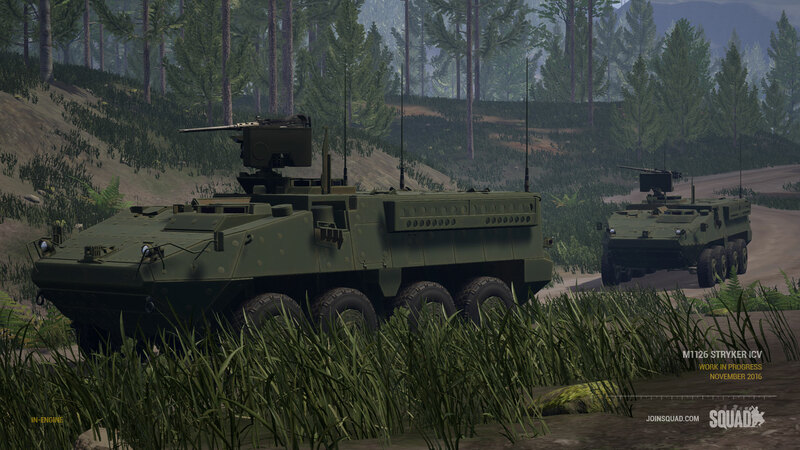 The first version to enter service is the Infantry Carrier Vehicle. A very tough transport and support vehicle that is designed to be proof against even fiercest .50 caliber weapon systems as well as shrugging off most rocket propelled grenades. Armed with a remote controlled M2A1 .50 cal machine gun and eventually functional smoke launchers, this is a tough, but valuable infantry support vehicle. It is likely that more variants of the Stryker chassis will be seen in time. 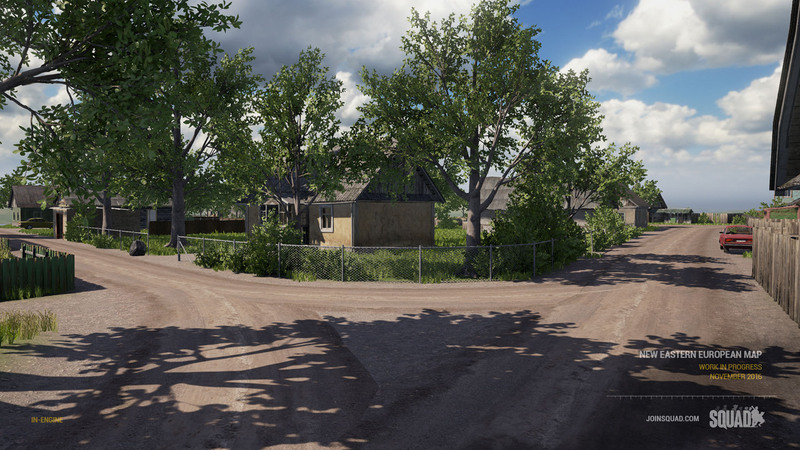 Work has begun on our newest map and were very excited about it because it will feature our first urban battlefield in the eastern European theater. 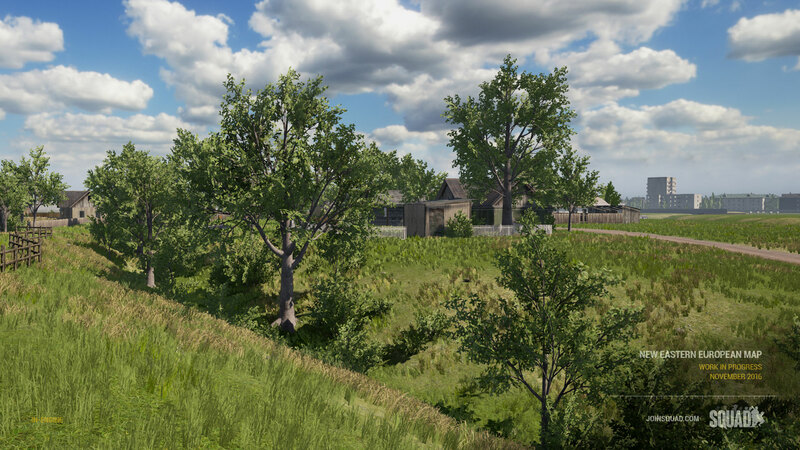 Our environment team has been busy creating brand new statics that include multi-story apartment buildings, commercial buildings, gas stations, and a variety of industrial facilities. 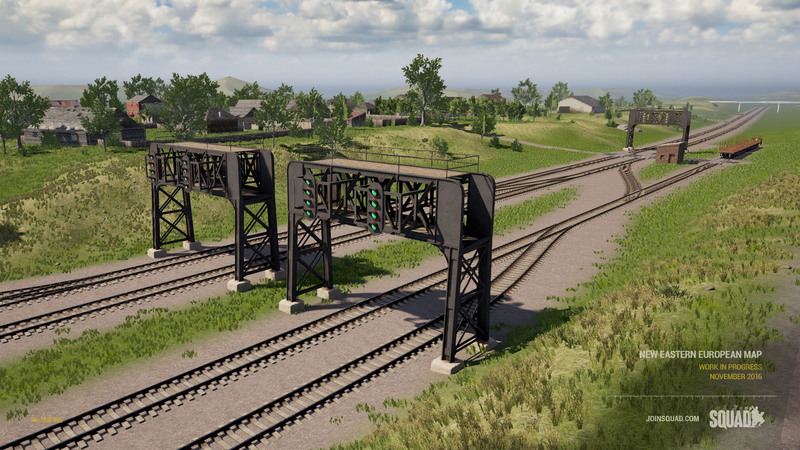 Most of the buildings will be enterable so close quarters infantry battles will be common, but the map will also have plenty of open and strategically complex areas with a mix of rail yards, parks, industry, and quiet residential streets. Look forward to fighting your way through the outlying residential areas, across railroad tracks and along tree-lined avenues -- all in a push to take the city center. With vehicles rolling out in full force, we are expanding Gorodok. 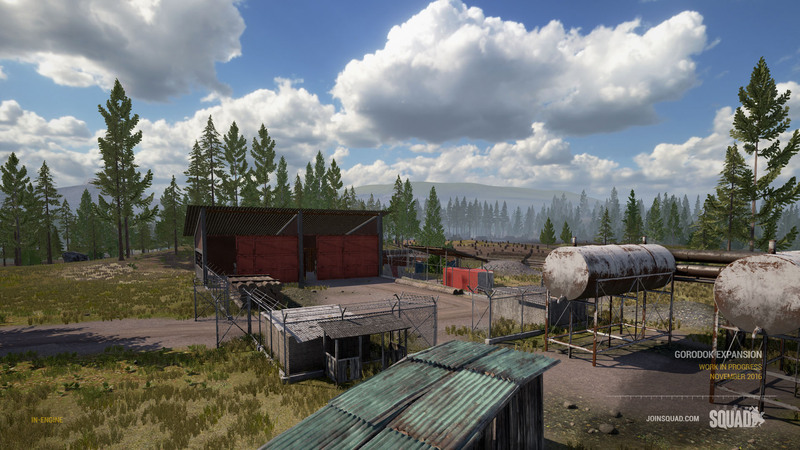 We've added surrounding terrain so that we can have a full 4k playable area. 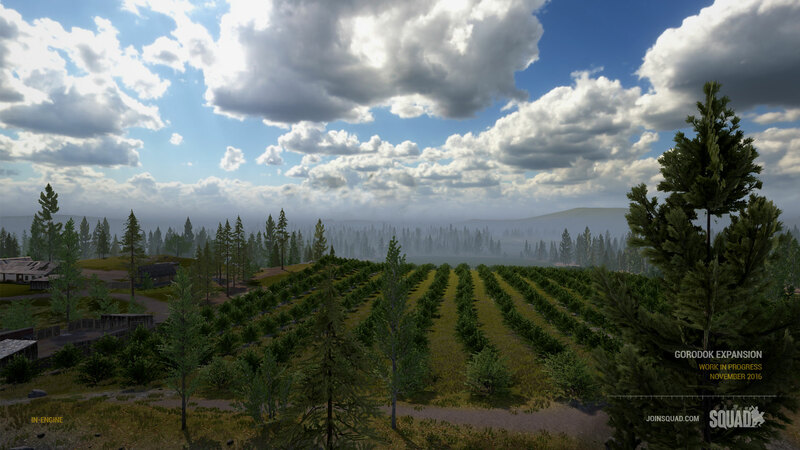 To showcase vehicle gameplay we've cleared a lot of trees and added larger plains and fields. 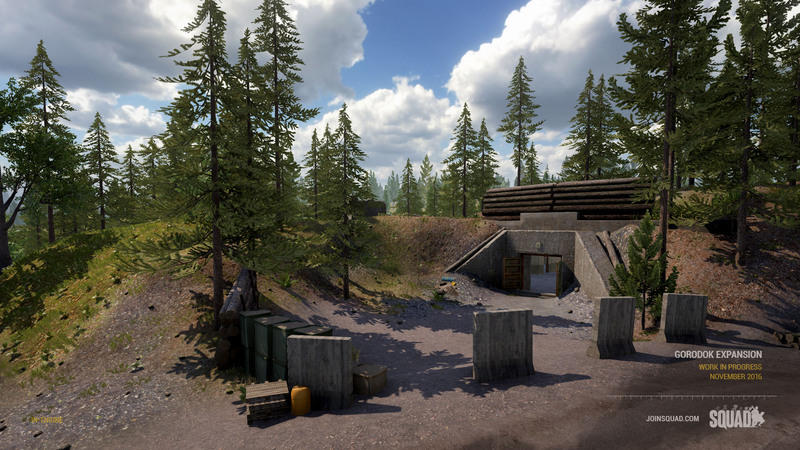 There will also be many new objectives and completely new gameplay layers including the Insurgency gamemode. In the end, Gordok will be almost 4x the size that it currently is and will provide many more unique gameplay experiences. Before we sign off, our talented composer Scott Tobin is preparing volume 2 of Squad's Original Soundtrack, which is coming to Steam. Please enjoy the wonderfully hand-crafted preview below!